1-on-1 with Gabe Landeskog - The Point Data-driven hockey storytelling that gets right to the point. The first time I met Gabe Landeskog was during his draft year, 2011. I invited his agent, Peter Wallen, to bring a few of his draft eligible prospects for a tour of the studios at TSN while they were in Toronto. As we walked past control rooms and sets for different shows, Gabe asked question after question. He wanted to know about production equipment, how it worked and who did what. At the end of the tour, I remember thinking to myself, this Landeskog kid – very intelligent and inquisitive. Eight years later, those qualities have helped him become one of the top goal scorers in the NHL. As he puts it, “If you’re not getting better, you’re getting worse.” I sat down with Landeskog during All-Star weekend to talk about his emergence as the top net-front scorer in the league, analytics and whether guys in the NHL celly a little harder on deflection goals than others. Kelly: Do you know how many deflection goals you have? Landeskog: No. Somebody did mention it to me a couple weeks ago and said it was a lot so I started thinking, maybe ten or something like that. Kelly: I’ll show you the leaderboard. Kelly: So, you’ve got twelve – Four more than anybody else. How are you doing it? Landeskog: During the summer you’re always looking at finding new ways to get be productive and get better, if you’re not getting better you’re getting worse. I was on Youtube looking at a guy like Anders Lee who scored 40 goals a couple years ago and Joe Pavelski who’s always up there in goals. I watched them and wanted to see how they scored their goals and obviously, me as a player, I go to the net-front and that’s where I have all my success, for the most part. So, I saw watching those guys, they scored 10-15 goals a year on tips and deflections and I figured if I get better at deflecting pucks in front of the net then maybe I can get over 30 goals for the first time in my career. Kelly: Well, you’ve got 29 at the All-Star break, I think you’ll be good for 30. It’s one thing to want to add a new element to your game but to actually be able to do it so well, so fast is pretty amazing. How did you get so good in this area so quickly? Landeskog: Honestly, just practice. After every practice, I’ll pull one of the defensemen over to the blueline and I go in front of the net and they shoot a bunch of pucks and I try to get a piece of them. Sometimes I want to work on forehand tips, sometimes backhand tips, sometimes I just want them to shoot anywhere and I just react which is something I’ve been doing a lot lately because that’s a part of the skill. It’s been a lot of work but it’s been fun and I feel like I’ve progressed in that way. Kelly: Other than practice, tell me about the technical aspects of succeeding in this area. Landeskog: For me it’s important to take away the goalies eyes and not just stand there with my stick on the sides. Adam Deadmarsh was my assistant coach my rookie year and he made a good point that if you’re standing at the net-front, your instinct is to show your defenseman where you want the shot to be but (Deadmarsh) always said, put your stick in the middle, it’s harder for the defenseman to tie you up. So, if you put your stick in front of you when the defenseman is beside you or behind you then they won’t be able to tie up your stick. If I’m at the net-front screening, I’ve always got my stick in front of me and that makes it harder for the defenseman to tie you up and then you can react both ways to the shot. If you have your stick on your forehand and the shot comes on your backhand, you’re going to be too late. So, that’s something I always think about. Kelly: There’s one deflection goal I want to talk to you about specifically from this season – you’re most recent one, against Toronto. Not only did you win the draw but you got position on John Tavares, and managed to get your stick on a shot going wide. Take me through that play. Landeskog: It’s funny, that game I think I only won one or two face-offs. That’s a play where I’m just trying to get to the net and hoping the defenseman is going to shoot it. I’m just trying to get a piece of it and deflect it down and it ended up bouncing in. 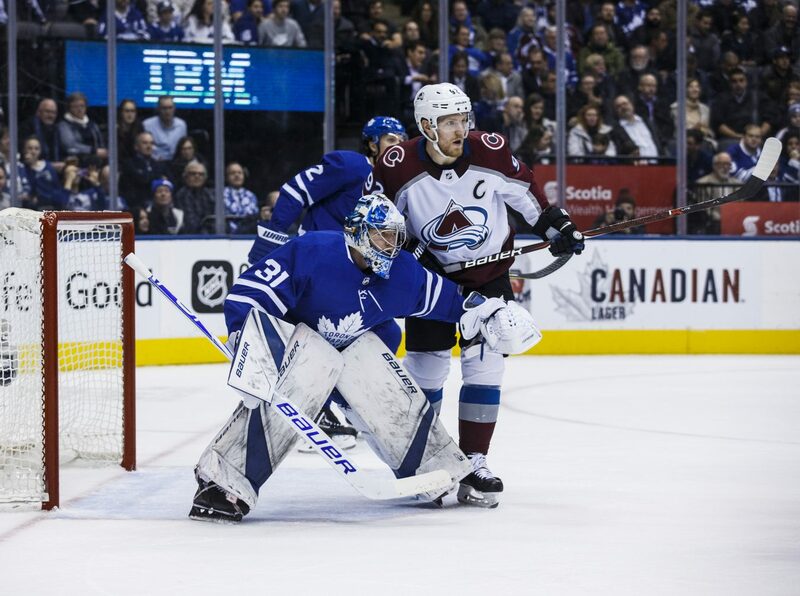 A lot of the time, I’m not aiming where I want to tip it – just trying to get a piece of it because any little deflection is going to put the goalie in a weird position where he’s not going to have time to react. Kelly: So, I play mens league and if guys ever get a piece of a shot there’s usually a big celly to let the refs know they got it. Gotta make sure you get credit for your goals, right. So, I watch for that in the NHL, too. With you, there’s never too much of a celebration. You’ll point to your defenseman a lot to give him some love. Where do you stand on deflection goal celebrations, in general? Landeskog: To be honest, I do recognize that. Playing junior hockey and all that, there’s not the same video replays so a lot of the time people make sure to tell the referees who got an assist or who scored. Playing in the NHL, there’s so many different video angles so my position has always been that if I get a piece of it, a camera angle will pick it up so I don’t have to show everybody that I scored. Act like you’ve done it before, that’s my mindset. Kelly: Any guys on your team or in the league who really sell it when they deflect a shot in? Landeskog: <Laughs> Ya, there’s a lot of guys who sell it. That list is long but I don’t want to throw anybody under the bus. Kelly: Keeping with the theme of hand-eye coordination, it also comes in handy for you on the defensive side. You block a lot of passes, some right out of the air, especially in the neutral zone which is key as changes of possession here can lead to quick offensive chances. You’re actually top-5 among forwards in blocked neutral zone passes. Landeskog: A little bit. I think it’s important. It kind of goes hand-in-hand with takeaways and things like that. That’s something I’ve always worked at – being in good position and having a good stick. I think that all goes hand-in-hand with this statistic. If you work on tipping pucks then those things happen automatically where you’re knocking pucks out of mid-air. Kelly: I’ve got a bunch of stats and where you rank, some things you’re probably pretty familiar with and some from a data analytics company, Sportlogiq, that you might not be. Take a look and let know what stands out. 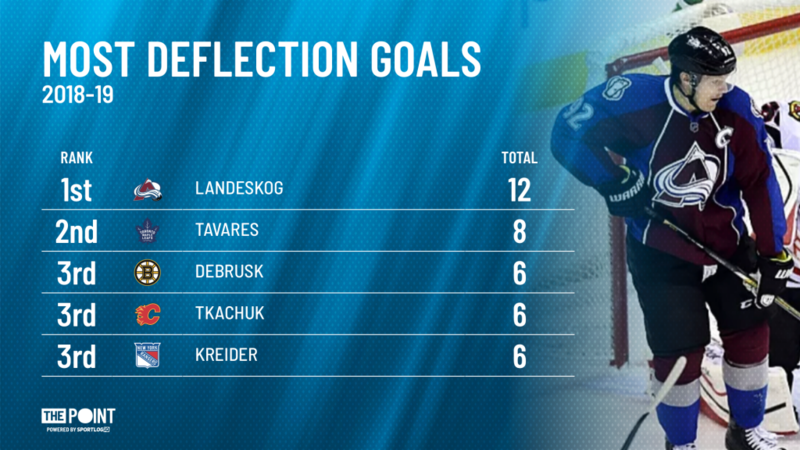 Landeskog: These are good stats. This one, offensive zone scoring chance generating plays. Kelly: So, that’s a combination of your scoring chances, defined as a shot attempt from the slot, plus the scoring chances you create. For instance, if you pass it to a guy in the slot, that’s a scoring chance generating play. It’s a way to measure your individual impact on the scoring chances you get and create. You rank 2nd on your team behind Nathan MacKinnon, who’s 3rd in the league. Landeskog: That’s cool. You’ve got some net-front presence stuff here. Kelly: Ya, how often a player deflects pucks, generates shots from the front of the net, their success rate creating certain types of shots. 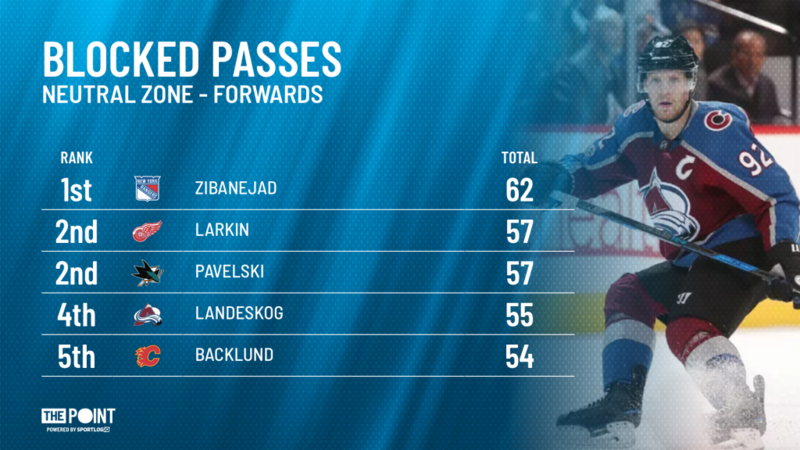 Landeskog: Who else would be at the top here for net-front presence type stuff. My guess would be Anders Lee, Joe Pavelski. Guys who tip the most pucks. Kelly: Here’s a list of guys who have tipped the most pucks so far this season. Landeskog: Yep. 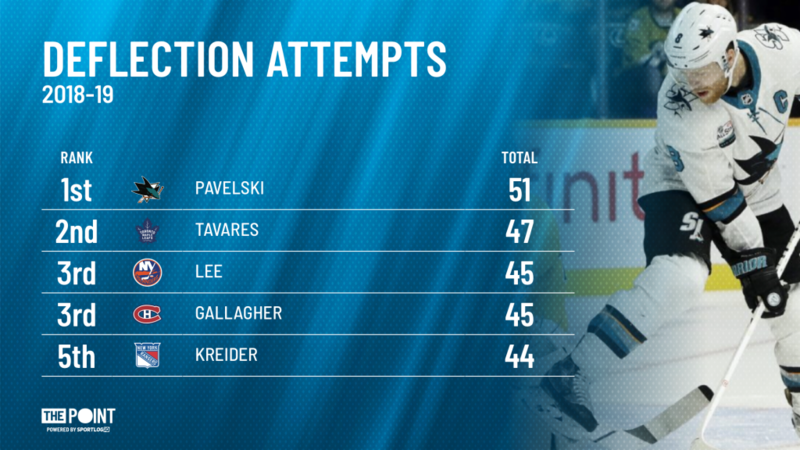 Pavelski number one. Tavares – ya, I guess he is playing net-front now. Lee, number three. Kelly: You’ve got a good eye for this stuff. The thing about you though is that almost half the pucks you’ve tipped on net have gone in. Pretty impressive. Landeskog: If anything that just shows you how hard it is for the goalie if you get a piece of it. Kelly: Appreciate you taking some time to chat. All the best with the rest of the season.